Joseph Stalin purged his officer corps of thousands of talented leaders before the start of World War II. It almost cost Russia the war. Officer corps expect to suffer heavy losses in war. The entire 1914 class of France’s St. Cyr military academy, for example, perished in World War I. But no officer corps ever suffered the degree of loss that the Red Army suffered in peacetime, at the hands of its own government, during dictator Joseph Stalin’s paranoid purge of 1937-1938. In a climate where stamp collectors could be shot for valuing old foreign stamps over new Soviet ones featuring Stalin’s portrait and astronomers could be executed for taking an ideologically incorrect position on sunspots, not even the Red Army was above suspicion. To begin with, it had been founded, organized, and largely officered by Stalin’s despised, defeated rival Leon Trotsky, and it remained under tenuous party control. Most suspicious of all was its long association with the German Army, going back to secret training in the 1920s and ongoing visits by Red Army officers to Nazi Germany. Much of Stalin’s paranoid fixation about the Red Army was focused on its head, Marshal Mikhail Tukhachevsky. As brutal as Stalin in quelling opposition, using poison gas on revolting peasants, and executing reform-seeking sailors, Tukhachevsky was a brilliant advocate of armored warfare. But it was his very emphasis on military professionalism that struck at the principle of party loyalty—which meant, essentially, loyalty to Stalin. Added to Tukhachevsky’s problems was the personal animosity of Marshal Semyon Budenny, one of Stalin’s closest military cronies. The rigorous examination of the army that Molotov had threatened actually had started seven months earlier with the arrest of a divisional commander in Kiev, Dmitri Shmidt. A supporter of Trotsky, Shmidt once had threatened to lop off Stalin’s ears with his sword. In what would become standard treatment at the hands of the NKVD, Shmidt confessed to plotting to assassinate Voroshilov, then received what became the standard consequence for such apostasy—a bullet to the back of the head. A corps commander close to Tukhachevky was arrested next, confessed in turn to plotting with Trotsky, and was shot as well. 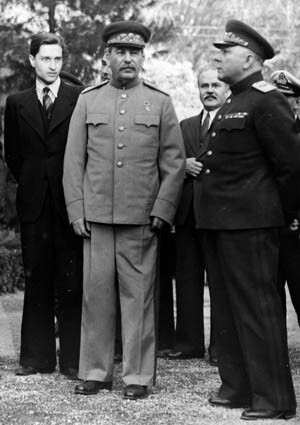 In Nazi Germany, Heinrich Himmler and Reinhard Heydrich forged documents showing Tukhachevsky and other generals were plotting with them against Stalin, and had them passed to Stalin through the president of Czechoslovakia. (Although Himmler and Heydrich would take credit for the bloodbath that followed, Stalin had already determined his murderous course of action and apparently made no use of the forgeries.) Stalin struck without warning. On May Day, Tukhachevsky found his way to his usual parade spot atop Lenin’s Tomb blocked by security guards, and 10 days later, without explanation, he was demoted to the command of the Volga Military District. Stalin assured Tukhachevsky that he would soon be back in Moscow, and he was—arrested on arrival and thrown into the dreaded Lubyanka Prison with Marshal Ion Yakir and six other generals. It took just two days for Tukhachevsky to sign a confession to being a Nazi spy. When his interrogation record was uncovered decades later after the fall of communism, the pages were splattered with blood—chilling evidence of the kind of force used to break the physically imposing Tukhachevsky. One of the generals, resigned to his fate, simply signed anything put before him to enjoy a comfortable cell, tea, and cigarettes for his last few days. “The snake said he was dedicated to the Motherland and Comrade Stalin,” NKVD chief Nikoli Yezhov reported about Tukhachevsky’s last words. He was fortunate not to live to see what such devotion was worth. Stalin had the general’s wife and two brothers shot, and his mother, daughter, and sisters shipped to a gulag. Yakir’s last words were also to no avail. Stalin had his wife, brother, sister-in-law, and nephew killed. 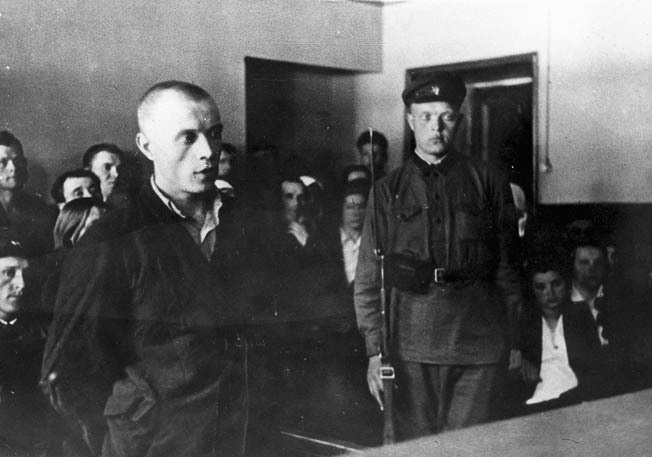 One of the judges, General Belov, told writer Ilya Ehrenburg: “Tomorrow I shall be put in the same place.” He was right: within the next 18 months, he and five other of the eight judges were executed. There was almost another. The NKVD came for Budenny, but he held them off at pistol point while calling Stalin to get the order canceled. The police left with his wife, instead. The scale of the purge was staggering: 13 of 15 army commanders, 50 of 57 corps commanders, 154 of 186 divisional commanders, 220 of 406 brigade commanders, all 11 vice-commanders of defense, 98 of 108 members of the Supreme Military Soviets, all army political commissars, 25 of 28 corps commissars, 58 of 64 divisional commissars. Even the lower ranks were not spared: almost half the colonels and 7,403 captains fell victim to the purge. “This is worse than when artillery fires on its own troops,” commented General Konstantin Rokossovsky. More Soviet generals and colonels were killed by Stalin than were to fall in World War II. A man appearing before a popular tribunal in the Soviet Union during the Stalinist purges against alleged Trotskyists and political opponents, 1935. The purge produced appropriately macabre scenes. An officer back from secret service in Spain’s civil war phoned friend after friend at their homes, only to find strangers now answering their phones. A general dropped dead of a heart attack upon hearing the dreaded predawn knock on his door—it turned out to have been a harmless messenger. “With each arrest it became more difficult to believe in the disloyalty, the sabotage, the treachery of these men,” said General Alexander Gorbatov. When he protested the arrest of his superior, he was inevitably jailed himself. Other officers he met in jail advised him to confess to anything about anyone “because they believed it was better to stand on their false testimony in order to put an end as quickly as possible to the torment and to die as quickly as possible.” But Gorbatov was an exception and, surprisingly, was not shot for his defiance, but merely sent to a Siberian labor camp. Another defiant general was Konstantin Rokossovsky. After having eight teeth knocked out and three ribs broken, he was hauled before the Supreme Military Court and told that another officer, named Yushkevich, had confessed to spying with him for Germany. Instead of submissively agreeing with the accusation and taking a bullet, Rokossovsky shouted back, “Can the dead give evidence?” “What do you mean the dead?” the surprised judge asked. Rokossovsky replied, “Well, Adolf Kazimirovich Yushkevich was killed in 1920 at Perekop.” When records bore him out, Rokossovsky became perhaps the only defendant ever acquitted in the purge, although he was still sent to one of the most dreaded gulag camps in Siberia, Vorkuta. The effects of the purge could be seen in the disastrous winter war with Finland in 1939-1940. As described by future Soviet premier Nikita Khrushchev: “Stalin was furious with the military and with Voroshilov—justifiably in my opinion. Stalin jumped up in a rage and started to berate Voroshilov. Voroshilov was also boiling mad. He leaped up, turned red, and hurled Stalin’s accusations back in his face: ‘You have yourself to blame for all this! You’re the one who had our best generals killed!’ Voroshilov then picked up a platter of roast suckling pig and hurled it against the table.” Although dismissed as commissar for defense, Voroshilov amazingly was not shot for his actions. He survived Stalin to serve as the Soviet Union’s ceremonial president, living until 1970. Rokossovsky went on to be the greatest Soviet commander of World War II after Grigori Zhukov, helping to win the battles of Stalingrad and Kursk and conquering Berlin. Another hero of the war to come, Marshal Ivan Konev, would argue: “Of the commanders destroyed—Tukhachevsky, Yeogorov, Yakir, Kork, Uborevich, Blyuker, Dybenko—only Tukhachevsky and Uborevich can be regarded as modern military leaders. Most of them were on the level with Voroshilov and Budenny. Those heroes of the Civil War were living on their past. If they had remained at the top the war would have turned out quite differently.” Konev might have thought differently had he known that when he was defeated early in the war, Stalin wanted him shot but was talked out of it by Zhukov. Tags adolf hitler and nazi germany, General Alexander Gorbatov, Great Purge, Heinrich Himmler, Joseph Stalin, Katyn Forest Massacre, Konstantin Rokossovsky, Marshal Georgi Zhukov, Marshal Ion Yakir, Marshal Kliment Voroshilov, Marshal Semyon Budenny, Mikhail Tukhachevsky, NKVD, Red Army, Reinhard Heydrich, Russo-finnish war, Vyacheslav Molotov, Winter War. It’s amazing for me to have a web site, which is beneficial in favor of my experience.